Home Latest News Is there really a 10-year rule to sort out trade? Is there really a 10-year rule to sort out trade? A number of obscure pieces of trade law have taken on near mythical status in the Brexit debate. One of them is Article 24 of the General Agreement on Tariffs and Trade (Gatt). 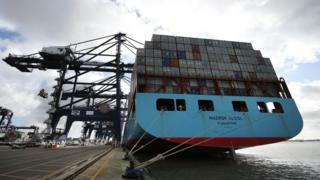 Supporters of a no-deal Brexit say it would allow the UK to continue to trade with the EU without tariffs (taxes on goods crossing borders) for up to 10 years, while the two sides negotiated a permanent future trade agreement. But the vast majority of trade experts who have looked into the issue disagree. No, they say, it’s really not that easy. If the UK leaves the EU with no deal, it will fall back on the rules of the WTO – the basic building blocks of international trade. At that point, the UK could choose to continue applying zero tariffs to goods being imported from the EU. But under rules set out in Article 1 of Gatt (which are commonly known as Most Favoured Nation (MFN) rules), it would then also have to offer the same terms to the rest of the world. What is the ‘no deal’ WTO option? If no-one had to pay anything to get their goods into the UK, that would certainly mean cheap imports. But it would also put a lot of British companies out of business and there would be no obligation on other countries to offer the UK the same tariff-free access in return. There are of course ways to bypass MFN rules and do specific deals – and this is where Article 24 comes in. It allows countries or trade blocs to agree lower (or zero) tariff rates with other countries or blocs, if they set up a customs union or a free trade area, or if they have an interim agreement – which acts as a stepping-stone to a permanent agreement in the future. But you do need to have a deal, at least in principle, to take advantage of that. Leaving with no deal suggests there would be… well, no deal. So Article 24 of Gatt wouldn’t apply in those circumstances. And, to state the obvious, to have a deal, you need both sides to agree: the UK can’t invoke Article 24 on its own. The other broad point to consider is that Article 24 applies to the trade in goods only. It has no effect on the trade in services, or on other important issues such as regulations and standards. It has been applied to “interim agreements” only on rare occasions since the WTO was established in 1995 and never to anything approaching the scale of the UK-EU trade relationship. Anyone looking for more detail on Article 24 could do a lot worse than read this explanatory piece from the House of Commons Library. But that may not stop it being cited as a solution on a regular basis.